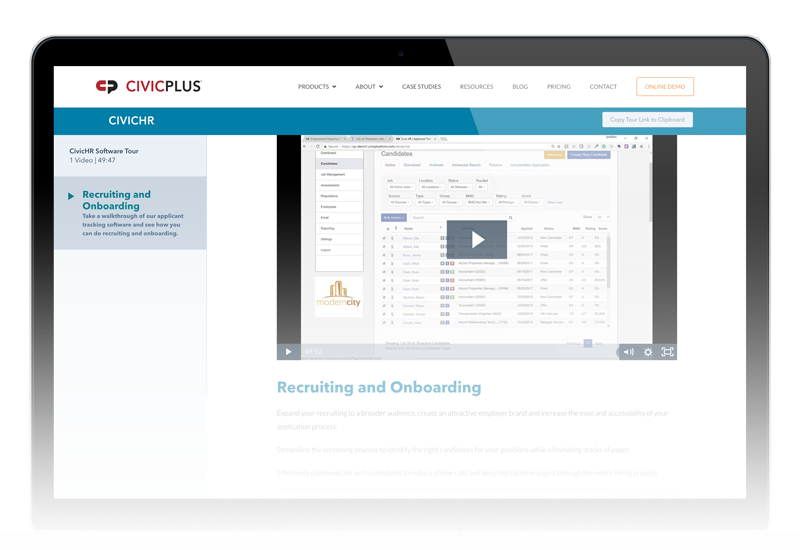 In this video demo series, learn what makes CivicHR the most flexible, comprehensive, and integrated cloud-based solution that allows human resource managers to recruit, identify, and hire talent, onboard new employees, and assess employee performance. Applicant Tracking Software - streamline the hiring process, helping you quickly find and select the best candidates. Employee Onboarding - create, distribute, and collect all necessary new employee forms, such as payroll forms, compliance documents, internal policy forms, etc. Performance Management - complete annual formal performance reviews digitally, streamlining processes and eliminating paperwork.